We had another snow storm this weekend, 8 inches this time. That was nothing compared with what hit my sisters got further to the south: 20 inches in Maryland, and a foot or more in Philadelphia. On Saturday, we snuck up to Maine for the day. We had planned to stay the night, but the weather wasn’t consistent with our plans. We wanted to check on things at the house, particularly the flying squirrel infestation. The house was in better shape than I expected. We only stayed a few hours. Time enough for look unsuccessfully for entrance points for the squirrels, replace the generator battery, and take Bella for a walk in the snow. We got home in time to meet Laury for her birthday dinner. She picked a Nepalese restaurant in Allston – Mt. Everest Kitchen. None of us had ever tried Nepalese food before. It was excellent, especially the oven roasted lamb and vegetables that Howard picked. Howard made a great dinner on Sunday. We had some short ribs in the freezer, one big package that we got at a farmers’ market in Maine plus one from Chestnut Farms. Coincidentally, the cover photo on a recent (October 2009) issue of Bon Appetit was of short ribs, providing the necessary inspiration. 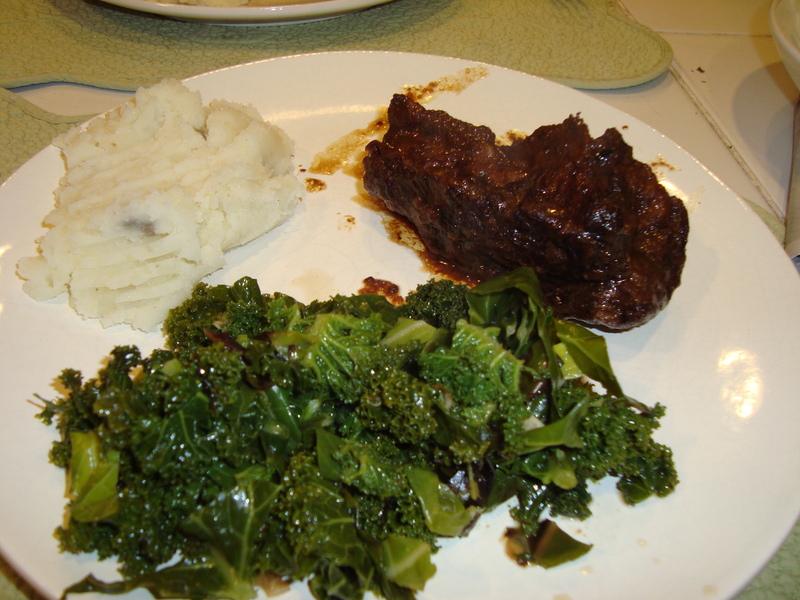 Officially, the recipe was called Braised Beef Short Ribs with Red Wine Gravy and Swiss Chard. We had all the ingredients in the fridge. Howard also made mashed potatoes. I made substituted kale and collards for the Swiss chard accompanying the ribs. Almost of the vegetables were from our CSA share. It was a very local meal. The rich vegetable sauce provided the perfect comfort food for a snowy evening. I liked the earthiness of the vegetables. I also liked that the vegetables were pureed in the food mill. I’m not wild about turnips, so it masked their presence in the dish. Howard has made short ribs several times using his sous vide apparatus. The prevailing opinion (well, two votes, mine and Howard’s) was that the short ribs have much better texture with Howard’s sous vide technique. Of course, that takes much longer than the afternoon, days in fact. But the slow cook in simmering water tenderizes all the fat and the meat just melts in your mouth. Next time, he’ll try to adapt the recipe for the very slow cook. More on that another time. 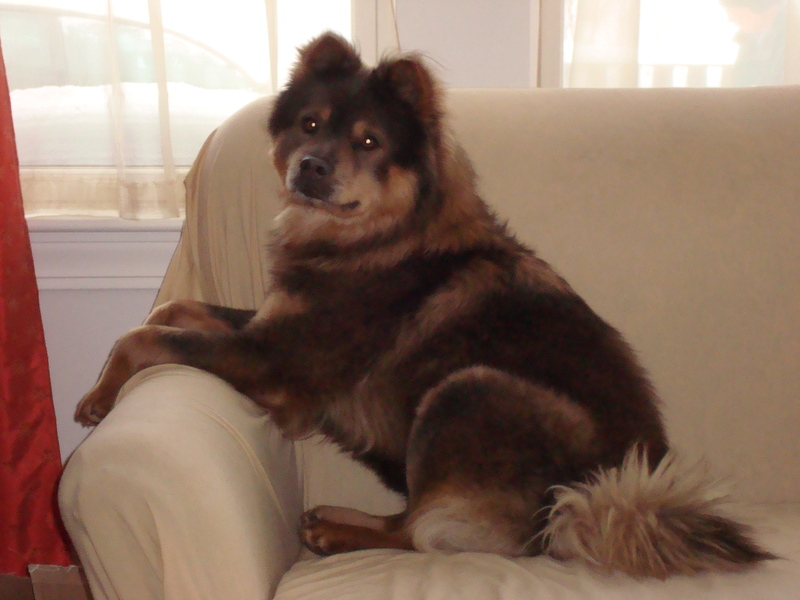 Bonus photo: Here is our “Devil Dog” Bella, perched on her favorite vantage point, watching Howard shovel snow. Bad dog. She knows she isn’t supposed to be on the couch.